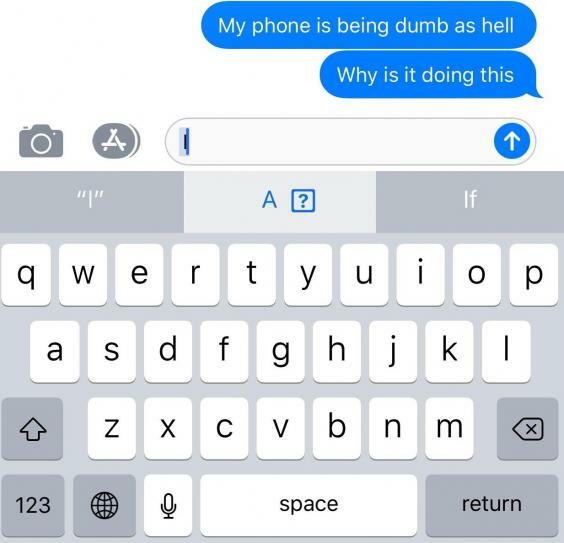 People with iPhones can’t write the letter “I”. The strange behaviour has caused consternation and confusion around the world, given that “i” is a rather important letter in the English language, as well as being a key part of the name of the iPhone, iPad and iOS 11, all of which are being hit by the bug. Thankfully, there’s a fix that makes your iPhone work properly. But it’s still not clear exactly why it’s required in the first place. In short, the bug affects people when they try to write the letter “I”. When they do, it will instead correct to “A” and a strange character. It’s possible to correct the letters once they’re in a text, though difficult since they’ll keep getting replaced and it’s easy to miss them in the first place. Any texts hit by the bug will obviously be rendered nonsensical – unless the person reading them is experiencing the same thing and so knows your pain. The bug arrived with iOS 11.1, a recent update that brought bug fixes as well as introducing a whole range of new emoji. But not every device running the new software seems to be running into it, and it’s not clear what lets some people avoid it. It seems to happen in every app that uses the keyboard, affecting not only iMessage but others like Instagram and Twitter. Apple has acknowledged the problem and an update to fix it is on its way. But it’s also offered a way to work around it in the meantime, with a slightly complicated but reliable fix that uses its text replacement tool. t’s done by heading to the Settings app, clicking general, navigating to keyboard and selecting text replacement. Click the little “+” button to add a new text replacement: type an upper-case “I” in the Phrase box, and a lower-case “i” in the Shortcut one. It’s not clear how the stray autocorrection made its way into the iPhone. Apple does make changes to the autocorrect keyboard – adding the names of new products when they come out, for instance – and corrections that a large number of people make get sent out to everyone, but given that the letter I still remains in fairly common use, it is presumably a bug either in the code or the dictionary.